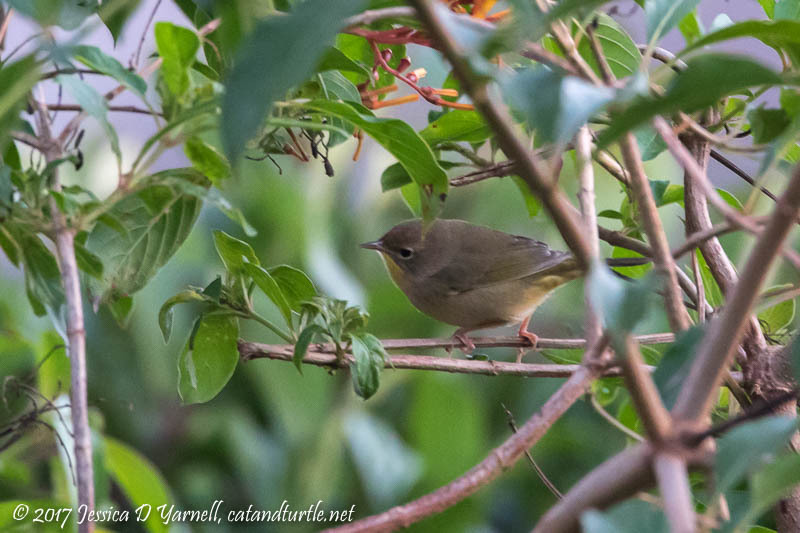 Blog > Backyard photography > Welcome Fall Birds! My favorite birding locations are slowly reopening after Hurricane Irma. I’m really missing the Lake Apopka Wildlife Drive, which won’t open again for a while. So when I have some free time, I sneak out into the backyard and say hello to the fall birds who are starting to return to Florida. Mew! Mew! Squirt (our gray cat) is happy to welcome back his namesake bird, the Gray Catbird who fusses almost as much as Squirt does. We’ve had at least two catbirds hanging out in the backyard this week. 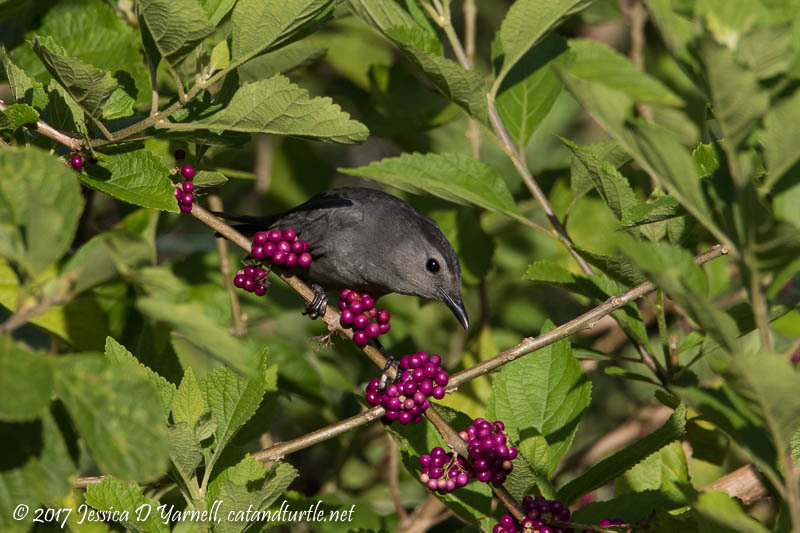 They compete with the mockingbirds for the berries on the American Beautyberry bush. Our hurricane hummers have gradually left us, either resuming their migratory travels or perhaps they found alternate nectar sources. 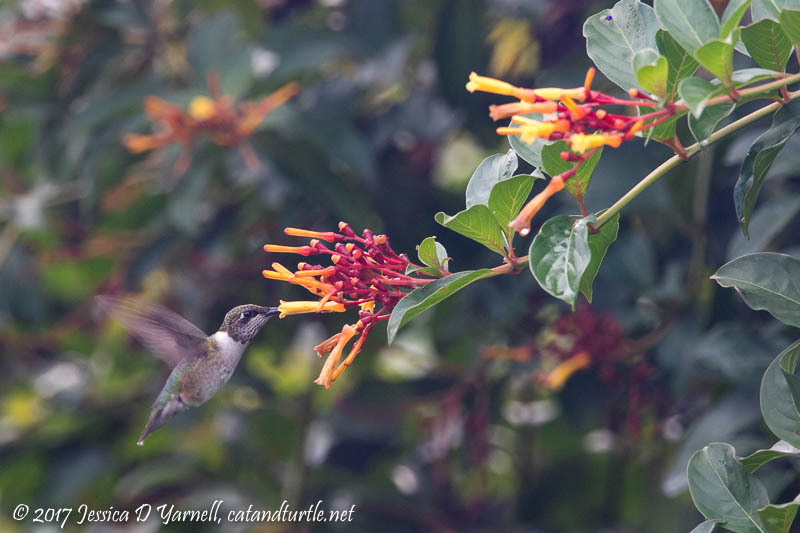 I still occasionally see a single hummingbird at one of my firebushes. I hope he sticks around for the winter. 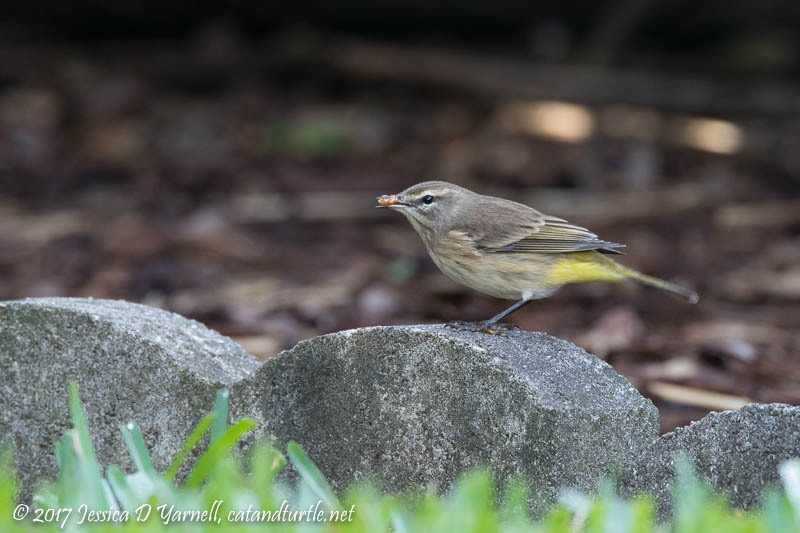 The Palm Warblers show up every year around the first of October. This year was no exception. Goldy enjoys watching “Mr. Warbles” hopping around outside her window and stealing mealworms from the feeder. 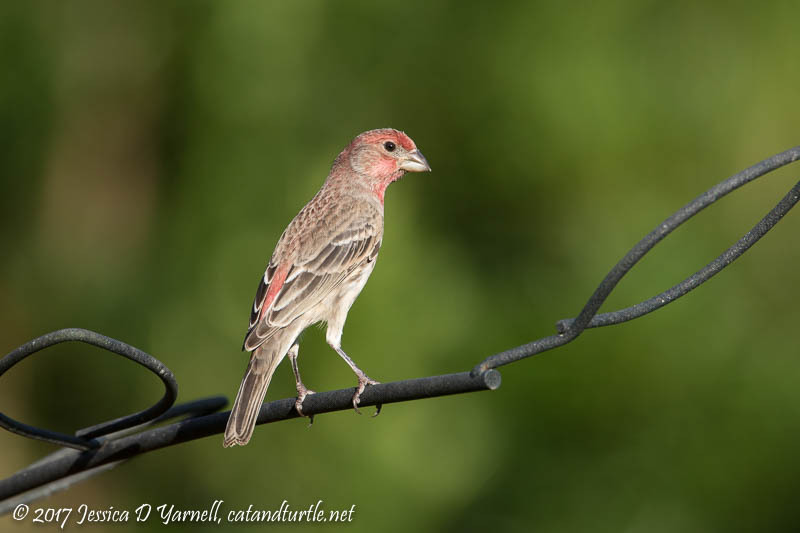 The House Finches have been around all summer, and they continue to visit. The juvenile House Finch with eye disease hasn’t been seen since Irma, but his parents still turn up periodically. 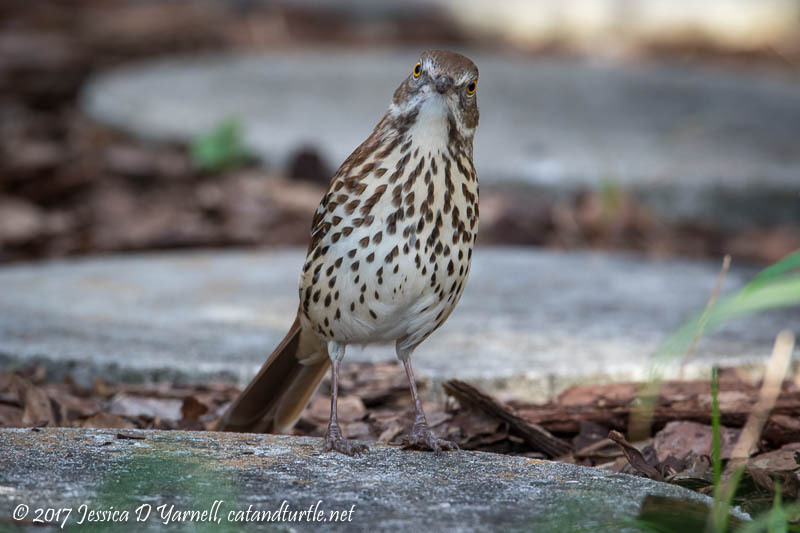 Our Brown Thrashers disappeared this summer, but they’ve started hanging out with us again. They too are fond of my mealworm dish. They also like to redecorate my flower beds, tossing mulch every which way. I love to listen to their sweet songs. 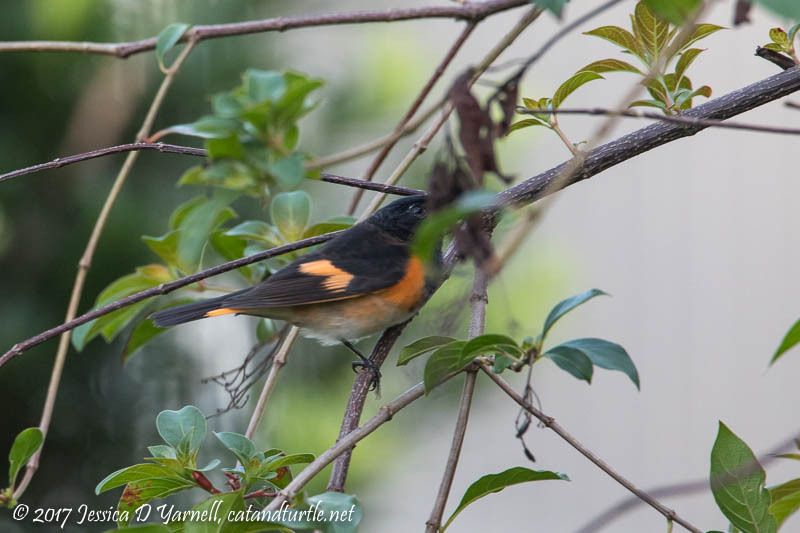 We had a group of three American Redstarts show up late one evening. They spent a lot of time hopping in the interior of my biggest firebush. One of the males came out for a quick photo op before diving back into the bush. Common Yellowthroats have made several appearances, often in male/female pairs. They too like to hide in the depths of the firebush. 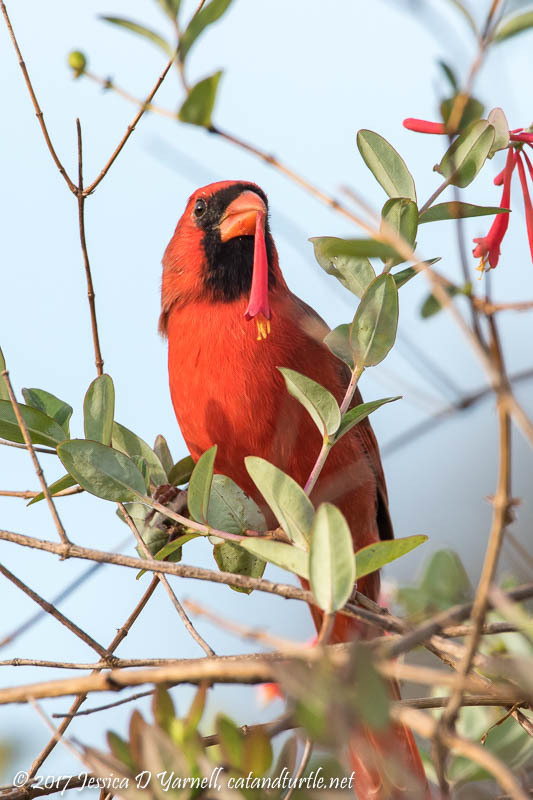 We have several pairs of cardinals who frequent the backyard. They are fond of stealing honeysuckle blooms and extracting the nectar from within. All beautiful pics! 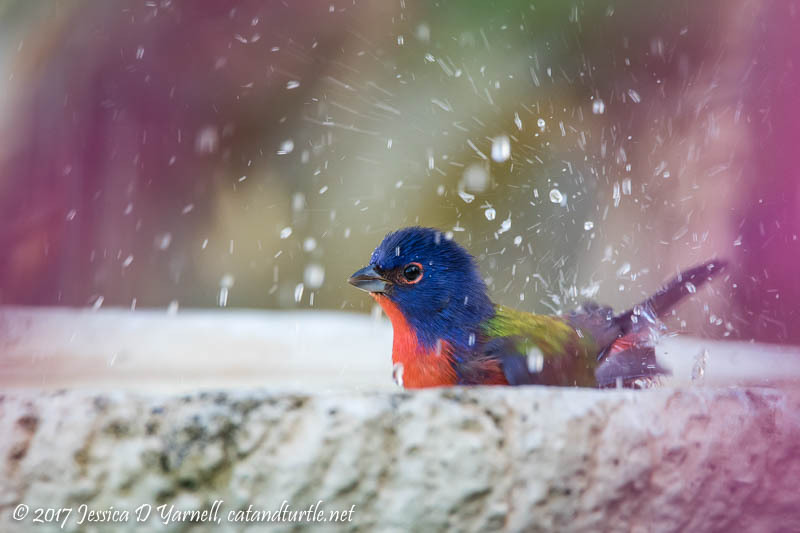 I’m still patiently waiting for the Painted Buntings to show this year. Those are fun yard birds! Tell the tanager to hop onto a pretty perch and reintroduce you tho your Beast.